Never paint or stain your interior doors again! Maintenance free and eco-friendly! 8 mm thickness MDF wood boards for door leaf and door frame ,and the surface is coated by pvc film. Inside Fir block structure for door body.Inside of our PVC door, there are one 4.5cm(width) x 3cm(thickness) Chinese fir stick on each side of doors. Another 2 fir stick in the middle part, and 2 very strong steel bars are next to them. This fir skeleton with steel bars avoids the risk of distortion. Our frame is adjustable and the adjustable range is 2cm. 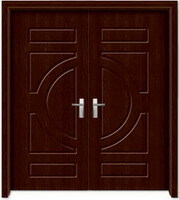 Accessories: lock,handle, hinges and installation bolt.